And guess what? You lucky, lucky readers will get the full Pochette which means that you'll get an additional surprise item I don't even know about! 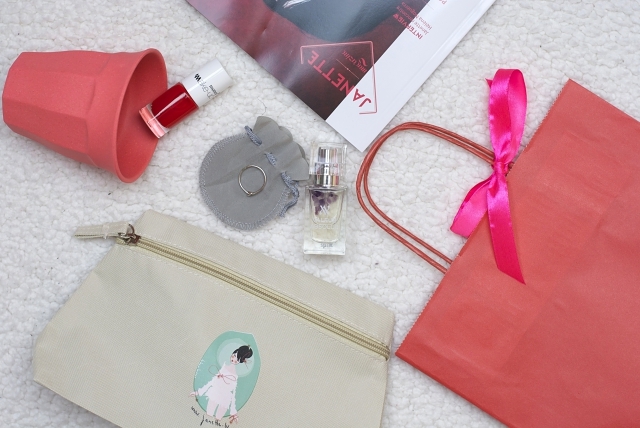 Besides from that the Pochette contains a Pierre Lorin silver ring worth 45€, a Monop' nail polish worth 2,99€, a Nordal mug provided by Cinnamon Home worth 4€ and the perfume "Valeur Absolue" worth 25€! So it's definitely worth trying your luck! The procedure is the same as always and this time the giveaway is open Europe-wide. Good luck to you and big thanks to Janette for offering us this cute giveaway! The perfume and the silver ring looks awesome! Thanks for the giveaway and greethings from Bulgaria! The nail polish looks gorgeous, so its my favourite item! I like the nail polish and the perfume! I want it!!! So beautiful and cute!!! I cross my finger to have the chance to win it!!!! I like the ring and perfume best.